This is a delicious (non-chocolate) Easter treat–an oatmeal cookie, but deluxe. It does take time to do the decorating, so child or adult decorators are very helpful. I made 24 small cookies that were about 2 inches long. For one person it takes about 3 or 4 hours from start to finish to bake and decorate 24 cookies. You could bake on one day and decorate later. It helps if you get all the icing and colours organized and mixed ahead of time. If you make larger size cookies it speeds up the process. You may want to double this recipe to get all the colour ranges. Cake decorating gel or food colouring, several colours of your choice. In a large bowl, cream butter and brown sugar until light and fluffy. Add egg and vanilla; mix well. Combine the flour, oats and salt and stir into creamed mixture. Divide dough into four equal portions. Use a spoon and your hands to portion and roll out uniform egg-shaped cookies in the size of your choice from each portion of dough. Place on ungreased or parchment-lined cookie sheets. Bake at 350° for 15-25 minutes or until set. Smaller cookies will bake more quickly. Cool completely. Combine glaze ingredients until smooth; spoon over cookies. Decorate with the glaze and have fun. Adapted from Country Woman magazine. There’s still time to get a bit messy and creative for Easter. Make and decorate these delicious egg-shaped oat cookies. Here’s a tasty meal for a cold winter’s night or a fast dish to take to a potluck meal. The pasta and the meatballs cook in the baking dish in the marinara sauce along with some extra water. It’s delicious and best of all there are hardly any preparation dishes to wash. Do you want to eat more vegetables? Add some chopped, frozen spinach to the tomato sauce. Picky eaters may not even notice it. Adjust oven rack to middle position and heat oven to 475 degrees. Grease a 9”x13” baking dish. Spread the uncooked, broken spaghetti into the prepared dish. Using hands, combine beef, bread crumbs, pesto, 1 teaspoon salt, and ¼ teaspoon pepper in bowl just until combined. Break off and roll mixture into 1-inch meatballs (about 16 meatballs). 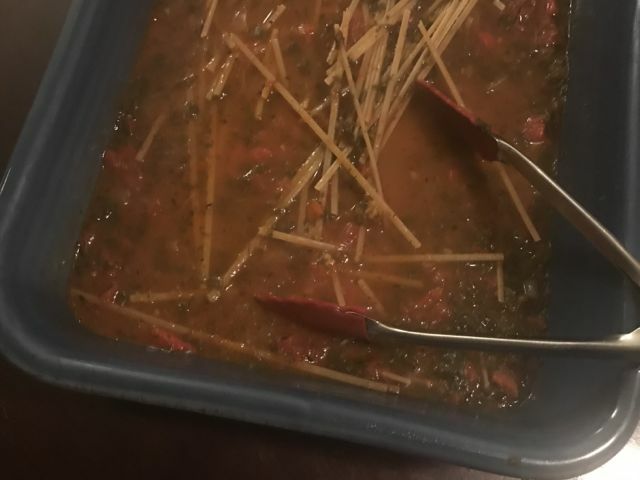 Pour marinara sauce and water over pasta and toss gently with tongs to coat. Nestle the meatballs on top of pasta in dish. Cover the top tightly with aluminum foil and bake for 30 minutes. Remove dish from oven and stir pasta thoroughly, scraping sides and bottom of dish. Return uncovered dish to oven and continue to bake until pasta is tender and sauce is thickened, 5 to 8 minutes. Remove dish from oven. Toss to coat the pasta and meatballs with sauce, adjusting sauce consistency with extra hot water as needed. Let cool for 10 minutes. Season with salt and pepper to taste. Serve with grated Parmesan. This is a tender scone that you can stir up quickly in one bowl. Because they are made with cream you avoid the sometimes tricky step of cutting in butter. Serve them with freshly cut strawberries and whipped cream, strawberry jam, or enjoy them plain. In a large bowl, mix together the flour, sugar, baking powder and salt. Begin to stir in the cream and then gently add the strawberries, if using. Stir only until the dough comes together. Gather the dough into a ball with your hands, adding any leftover bits from the side of the bowl. Place it on a parchment-lined baking sheet. Fold it over itself two or three times and pat it into a 1-inch thick circle. Brush the top with a bit of cream and sprinkle with sugar. Using a large, sharp knife cut the dough into 6 or 8 wedges and separate them, so that they have room to rise and to brown. Bake for 15-20 minutes, or until golden. Serve warm. 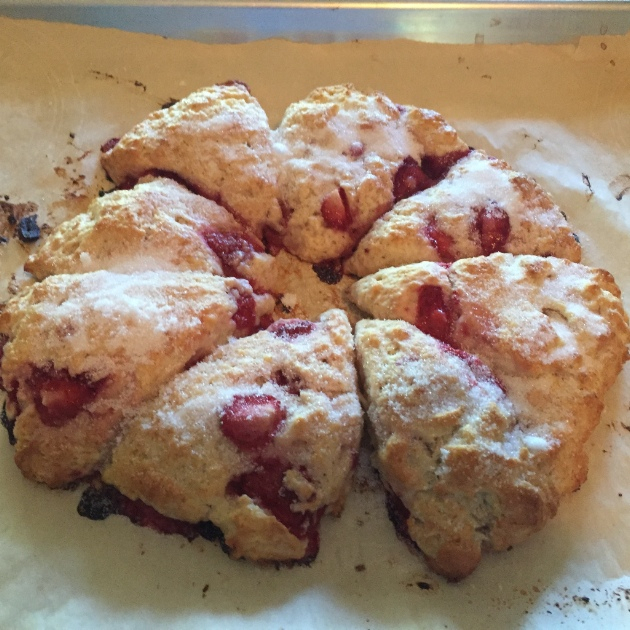 Adapted from Dinner With Julie, Rhubarb Cream Scones. Get your candy fix quick with this easy treat. If you love caramel flavour this is the cookie/candy for you and the oats give it a bit of a “healthy” spin. In a bowl stir together the oats, baking powder and salt. In a heavy saucepan melt the butter. Add the brown sugar raising the heat to medium-high until it boils. Let it bubble gently without stirring for a few minutes. Remove from heat and stir in the dry ingredients. Then stir in the vanilla. Press into an ungreased 8”x8” pan. Flatten the mixture evenly in the pan with back of spoon. Bake at 300 degrees for 20 minutes or until lightly browned. Cool, cut into squares and enjoy! If you have “fear of making pie” this pie is for you! It’s easy to make, uses just a few ingredients and making the crust is low stress because it uses cookie crumbs. The tang of rhubarb mellows out in the creamy filling. We’ve made it here with Molasses Crinkles cookie crumbs that contrast well in taste with the rhubarb. 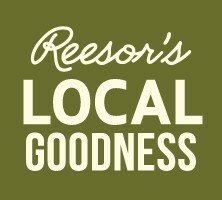 6 Molasses Crinkle Cookies from Reesor’s Market & Bakery (our chewy, ginger cookie), or 1½ cups of cookie crumbs that you think goes well with rhubarb. Place 6 Molasses Crinkle Cookies in blender or food processor. Chop until they are fine crumbs. Using a soup spoon press the finely crushed cookies evenly into the bottom and sides of a 9-inch pie plate. Set aside. Combine the rhubarb, sugar and the cornstarch in a medium saucepan. Add a quarter cup of water. Bring to a simmer, stirring often, until the rhubarb softens and the mixture thickens, add more water if necessary, watching that it doesn’t burn. In a medium bowl whisk together the sour cream, cream, eggs, almond extract and salt. Pour the cream mixture over the rhubarb and stir together. Pour the mixture into the cookie crumb crust. Place the pie on a cookie sheet so that it’s easy to get the pie into and out of the oven. Bake for about 40-45 minutes, until the pie is golden, partially set in the middle and set around the edges. Cool. Then refrigerate for a few hours, until chilled or enjoy it slightly warm. We love peanuts and peanut butter in all kinds of ways, but did you know maple goes great with peanuts? March is maple month in Ontario, so come on board the maple syrup train and make this delicious and easy maple syrup and peanut butter granola. You’ll be nibbling on these clumps and chunks for snacks and looking forward to your nutty granola breakfast with milk or yogourt. 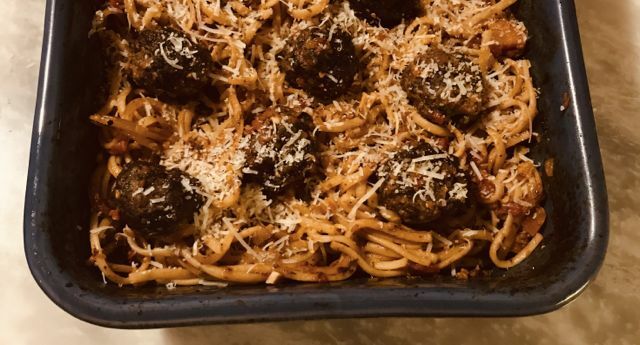 Calgary food writer and cookbook author Julie Van Rosendaal created this recipe which Jay’s sister Karla makes for her family. Thanks Julie for allowing us to share this recipe. In a large bowl, mix together the oats, almonds, coconut and salt. In a small saucepan, combine the peanut butter, brown sugar and maple syrup over medium heat and stir until everything is just melted and smooth. Pour over the oat mixture and stir until well combined. Spread the mixture onto a large rimmed cookie sheet or a roasting pan and bake for 30-40 minutes, stirring once or twice, until pale golden and crunchy/clumpy. Careful stirring will preserve the delectable clumps. Let cool and then stir in the dried fruit. Store in Mason jars or an airtight container. Makes about 6 cups. This zesty salad can be made with fresh or frozen sweet corn kernels. When you have some leftover cooked corn on the cob just cut off the kernels and whip up a salad. Since frozen corn is blanched (lightly cooked before freezing), you can use it right out of the freezer when making the salad. Add the amount of Tabasco sauce or chill powder you prefer to get the right amount of heat. Mix all salad ingredients together in a serving bowl. Set aside. Pour dressing over the other salad ingredients and toss gently to coat. Cover and refrigerate for a few hours or overnight before serving. Do you know what a food hack is? It’s a way to make your cooking life a little easier, or a different, innovative way to prepare a food. Here’s a way to use your package of Reesor’s Multi-Grain Pancake Mix to go a little “gourmet”—make crepes. Put one cup of the dry pancake mix in a blender. Grind until smooth textured. Add the remaining ingredients to the blender and whir until blended. Transfer to a bowl or put the blender jar in the fridge for about 30 minutes to rest and to let the air bubbles release (if you have time). Or just go ahead with the next steps. Preheat over medium-high heat, an approximately 8” frying pan or a crepe pan if you have one. Add a small amount of oil. Pour a little less than 1/4 cup of batter into the hot pan and tilt the pan to spread the batter into a thin, round layer. Turn the crepe when it is bubbly, firm and lightly browned on the other side. Loosen the edges before turning. Then turn and brown it on the other side. Stir the batter and scoop it from the bottom of the bowl each time you scoop out the batter. Repeat. Flip the finished crepes onto a plate, stacking them up until ready to fill and serve. Be prepared for the first one or two crepes to be imperfect, but as you go along the crepes should look better. If you use plain flour instead of pancake mix add about 1/4 teaspoon of salt. Sauté 2 cloves of mashed garlic and make a white sauce or a cream sauce, and add shredded cheddar cheese or your favourite cheese with 1 tsp of lemon juice to the sauce. Serve with asparagus.